Related terms: Klangkunst, sound installation (since late 1960s), Klanginstallation, sound-space-art (Leitner c1971 ), sound sculpture (see Grayson 1975), Klangskulptur, sound walk, sonic art (see Wishart 1985), musicalization of sound (see Lander 1990), sound in the arts (see Kahn 1999), audio art (see Föllmer 2004), Audiokunst, sound in art. Sound Sculptures, Wergo, 1985, 2-LP. Curated by Klaus Hinrich Stahmer. From The Pages Of Experimental Musical Instruments series, 8 volumes, Experimental Musical Instruments, 1986-1993. Cassettes. Curated by Bart Hopkins. Tellus 24: FluxTellus, 1990. Cassette. See also the sections Magazines, Catalogues and Monographs below. Publications on individual artists are included in their respective pages. For further bibliographies see also the entries on Radio art, Sound poetry, Field recording, Electroacoustic music and Noise. The works are in English unless noted otherwise. How to contribute. The following bibliography is made to be an online reader on sound art as well. A number of included publications is already available online thanks to the publishers, fans, researchers or authors themselves, however we are still missing many of the early writings, the out of print and hard to find catalogues, journals and monographs. You are greatly welcome to contribute to the reader by uploading any missing scans to the wiki or contacting the editor (db at monoskop dot org). Suggestions for omitted works are also appreciated. Sound Image: A Magazine of Aural and Visual Arts, 3 vols., Deerfield, MA: Sound Image Inc., 1975-77. LP-magazine. Published by Jim Metzner. Volume 1, . The Wire, London, since 1982. Essays in Sound, eds. Shaun Davies, Annemarie Jonson, et al., Newtown, NSW: Contemporary Sound Arts, 1992; 1995; 1996; 1999. Sound Arts: Xebec SoundCulture Membership Magazine, Kobe: Xebec Corporation, 1994-1998. Writing Around Sound, 3+ issues, since 2015. 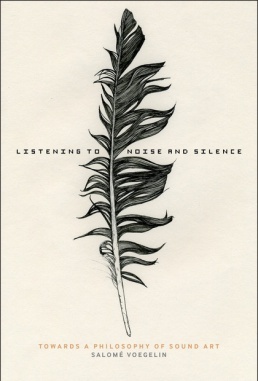 Print journal that engages with audio culture and sonic art in New Zealand. 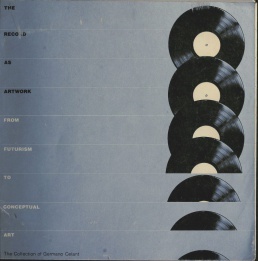 The Record as Artwork: From Futurism to Conceptual Art, 1977, Log, PDF. 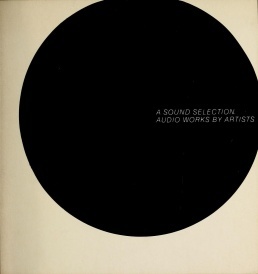 A Sound Selection: Audio Works by Artists, 1980, Log, PDF. Für Augen und Ohren: von der Spieluhr zum akustischen Environment, 1980, Log, PDF. Ars Electronica: Der freie Klang, 1987. PDFs (DE). Heidi Grundmann (ed. ), Zeitgleich, 1994. HTML (EN/DE). 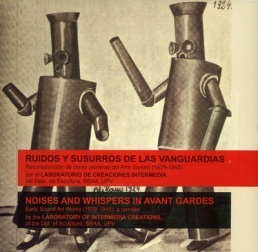 Noises and Whispers in Avant-Gardes: Early Sound Art Works, 1909-1945, 2004. Catalogue, MP3s. 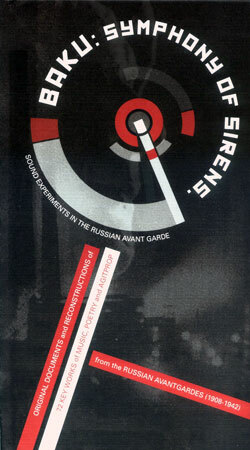 Miguel Molina Alarcón, Baku: Symphony of Sirens: Sound Experiments in The Russian Avant-Garde, 2008. Sound, ed. & intro. Ray Pierotti, New York: Museum of Contemporary Crafts, 1969,  pp. Exh. held 25 Oct 1969-4 Jan 1970. Sounds: 4 Lainoc: Sound/Environments by 4 Artists, ed. Betty Turnbull, Newport Beach, CA: Newport Harbor Art Museum, 1975. Exh. held 8 Dec 1975-11 Jan 1976. 6° Internationaal Mixed-Media Festival 1976, Ghent: Stichting Logos, 1976. Held at Koninklijke Academie voor Schone Kunsten, Ghent; 26-29 Jan 1976. VIIe Internationaal Mixed-Media Festival 1977, Ghent: Stichting Logos, 1977. Held at Museum voor Hedendaagse Kunst, Ghent; 21 Feb-3 Mar 1977. VIIIe Internationaal Mixed-Media Festival 1978, Ghent: Stichting Logos, 1978. Held at Oranjehuis, Antwerp; 5-12 Feb 1978. 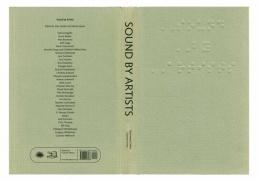 A Sound Selection: Audio Works by Artists, ed. Barry Rosen, intro. Helene Winer, New York: Committee for the Visual Arts, 1980,  pp. Exh. held at Artists Space, New York, 1977. Soundings, ed. Suzanne Delehanty, Purchase, NY: Neuberger Museum/State University of New York, 1981, 96 pp. Exh. held 20 Sep-23 Dec 1981. Essays by Suzanne Delehanty, Dore Ashton, Germano Celant and Lucy Fischer. Sonorità prospettiche: suono, ambiente, immagine / Perspectival Sonorities: Sound, Environment, Image, ed. 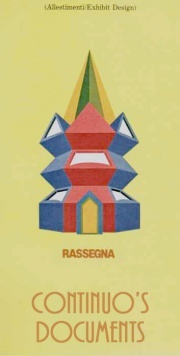 Franco Masotti, Rimini: Il Comune editions, 1982, 183 pp. Catalogue for an exhibition dedicated to Athanasius Kircher, curated by Franco Masotti and held on 30 January-15 March 1982 in Rimini. Exhibition review. (Italian)/(English) Introduction also in (German). Sound In Space: Adventures in Australian Sound Art, Sydney, 1995. Exhibition curated by Rebecca Coyle; held at Museum of Contemporary Art, Sydney, 26 May-22 Aug 1995. Coyle's essay, Introduction to a special issue of Essays in Sound dedicated to the exhibition. Ssshhhhh....., Copenhagen, 1999, 72 pp, PDF. 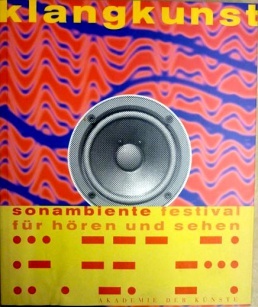 Sound biennale held 1-21 Oct 1999. The American Century: Art & Culture 1950-2000, ed. Lisa Phillips, New York: The Whitney Museum, with W.W. Norton, 1999, 398 pp. The exhibition included I Am Sitting in a Room: Sound Works by American Artists 1950-2000 programme curated by Stephen Vitiello, 11-16 Jan 2000. , , Review of the programme, Interview with the curator. Sonic Boom: The Art of Sound, London: Hayward Gallery, 2000, 128 pp. With 2-CD. 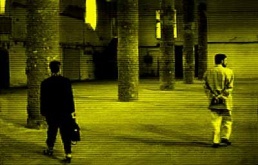 Large-scale exhibition curated by David Toop; held 27 Apr-18 Jun 2000. CD,  . Helga de la Motte-Haber, "Esthetic Perception in New Artistic Contexts". Sounds. Radio - Art - New Music, Berlin: n.b.k., 2010, 32 pp. Soundings: A Contemporary Score, eds. Barbara London and Anne Hilde Neset, New York: Museum of Modern Art, 2013, 72 pp. TOC, Introduction, Excerpt. Online companion. Exh. held at MoMA, 10 Aug-3 Nov 2013. Word. Sound. Power, London: Tate Modern, 2013. Exhibition held 12 Jul-3 Nov 2013. Curated by Loren Hansi Momodu and Andi-Asmita Rangari. Soundtracks, forew. Neal Benezra, intro. Rudolf Frieling and Tanya Zimbardo, ed. Jennifer Knox White, San Francisco: San Francisco Museum of Art, 2017. Digital catalogue; with contributions by Dena Beard, Chris Downey, Rudolf Frieling, Brandon LaBelle, Frank Smigiel, and Tanya Zimbardo. Exh. curated by Rudolf Frieling and Tanya Zimbardo; held 15 Jul 2017-1 Jan 2018. List of catalogues of collective exhibitions of sound art in Spain. Sound as Visual / Visual as Sound, Vehicule, Montreal, Mar 1973; Wayne State College, Detroit, Jun 1973. Audio Works, Artists Space, New York, 21 Jan-18 Feb 1978. Revolutions Per Minute: Sound Art China, exhibition, New York, 2013; Shanghai, 2013. Curated and produced by Dajuin Yao, Post-Concrete, Chinese New Ear, and Open Media Lab. See also SAET: Sound Art Exhibitions Timeline compiled by Jérôme Joy and Thom Holmes (former version) and an overview of group exhibitions of sound art from 1964-2012 in Maes 2013. John Grayson (ed. 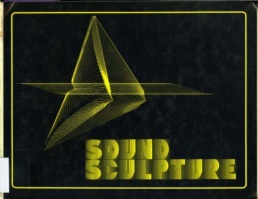 ), Sound Sculpture, 1975. PDF. Dan Lander, Micah Lexier (eds. ), Sound by Artists, 1990, Log, PDF. Critical Ear, Errant Bodies. Series of monographs featuring contemporary artists working with sound, experimental music and electronic media. Errant Bodies: Anthologies. Publications exploring themes related to sound art, performance, radio and spatial practices. Trevor Wishart, On Sonic Art, 1985/1996. Download. Douglas Kahn, Noise, Water, Meat: A History of Sound in the Arts, 1999. Download. Allen S. Weiss (ed. ), Experimental Sound & Radio, 2000. Download. 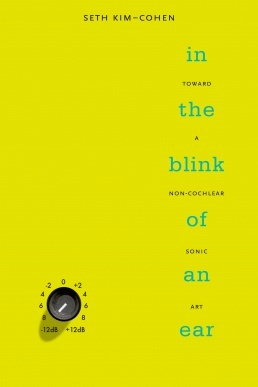 Seth Kim-Cohen, In the Blink of an Ear: Toward a Non-Cochlear Sonic Art, 2009. Download. Salomé Voegelin, Listening to Noise and Silence, 2010. Download. Helga de la Motte-Haber, Musik und Bildende Kunst. Von der Tonmalerei zur Klangskulptur, Laaber: Laaber-Verlag, 1990. Douglas Kahn, Gregory Whitehead (eds. ), Wireless Imagination: Sound, Radio, and the Avant-Garde, MIT Press, 1992, xi+452 pp. Adalaide Kirby Morris (ed. ), Sound States: Innovative Poetics and Acoustical Technologies, University of North Carolina Press, 1997, 349 pp. Douglas Kahn, Noise, Water, Meat: A History of Sound in the Arts, MIT Press, 1999, 455 pp. Sparked by Dan Lander's idea of "musicalization of sound" presented in the volume Sound by Artists. (; 363-4, n22). "By sound I mean sounds, voices, and aurality--all that might fall within or touch on auditive phenomena, whether this involves actual sonic or auditive events or ideas about sound or listening; sounds actually heard or heard in myth, idea, or implication; sounds heard by everyone or imagined by one person alone; or sounds as they fuse with the sensorium as a whole" (3). 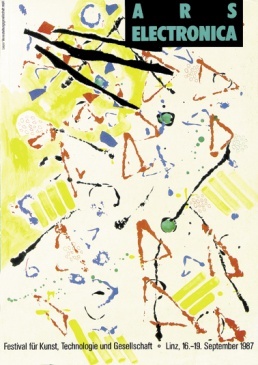 Karin von Maur, The Sound of Painting: Music in Modern Art, Prestel, 1999, 128 pp. Allen S. Weiss (ed. 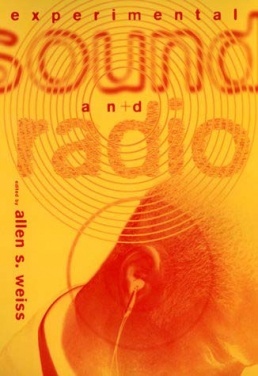 ), Experimental Sound and Radio, MIT Press, 2000, 188 pp. Jim Drobnick (ed. ), Aural Cultures, Toronto: YYZ Books, Banff: Walter Philips Gallery Editions, 2004, 288 pp. With Audio CD. , Review. Maja Kuzmanovic, nadine, Annemie Maes, Yves Bernard (eds. ), .x-med-a., experimental media arts, Brussels, 2006, 156 pp. Leigh Landy, Understanding the Art of Sound Organization, MIT Press, 2007, 303 pp. Ulrich Tadday (ed. ), Klangkunst, Munich: Richard Boorberg, 2008, 199 pp. (German). Excerpt. Contributions by Helga de la Motte, Volker Straebel, Sabine Sanio, Uwe Rüth, Wolfgang Heiniger, Julia H. Schröder, Christoph Metzger, Bernd Schulz/Carsten Seiffarth, Claudia Tittel, and Marion Saxer. Frances Dyson, Sounding New Media: Immersion and Embodiment in the Arts and Culture, University of California Press, 2009, 262 pp. Craig Dworkin, Unheard Music, information as material, 2010, 30 pp. A survey of almost one hundred compositions and performances of silent music. Thomas Bey William Bailey, Micro Bionic: Radical Electronic Music & Sound Art in the 21st Century, Creation Books, 2009; 2nd ed., Belsona Books, 2012, 417 pp. Peter Kiefer (ed. ), Klangräume der Kunst, Heidelberg: Kehrer, 2010. With Video-DVD. (German) Review. Andrey Smirnov, Sound in Z: Experiments in Sound and Electronic Music in Early 20th-century Russia, London: Koenig Books & Sound and Music, 2013, 281 pp. Seth Kim-Cohen, Against Ambience, Bloomsbury, 2013.
eldritch Priest, Boring Formless Nonsense: Experimental Music and the Aesthetics of Failure, Bloomsbury, 2013. , Excerpt. Reviews: Hainge (2013), Key (2013), Neural (2013), Hugill (2015). Invisible Places, Sounding Cities: Sound, Urbanism and Sense of Place, eds. Raquel Castro and Miguel Carvalhais, Viseu: Jardins Efémeros, 2014, 808 pp. Proceedings. Caleb Kelly, Gallery Sound, New York: Bloomsbury, 2017, 176 pp. Review: Barber (Leonardo). Jane Grant, John Matthias, David Prior (eds. ), Oxford Handbook of Sound Art, Oxford: Oxford University Press, forthcoming 2018. 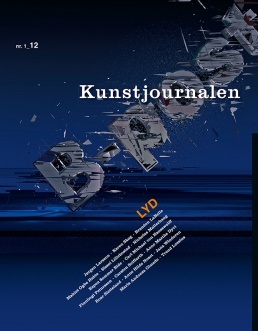 Kunstjournalen B-post: "Sound / Lyd", 2012. View online (EN/NO). 3rd Degree 4: Special Issue: "Earshot" (1988), ed. Shelly Cox, et al. Art & Text 31: Special Issue on Sound (Dec-Feb 1989), ed. Martin Harrison, et al. New Music Articles 8: Special Issue on Sound (1990), ed. Frances Dyson. West 5: Special Issue on Sound Cultures (1992), ed. Colin Hood. P-Form 33: Special Issue on Audio Art (1994), ed. Lou Mallozzi. InterCommunication 9: Special Issue: "Turning Forks: Technologies of Sound and Music" (Summer 1994), Tokyo. Open 9: "Sound. Sound in Art and Culture", Rotterdam: nai010, Nov 2005. The Iowa Review Web 8(1): Special issue on Sound Art, ed. Ben Basan, Feb/Mar 2006. John Grzinich (ed. ), kunst.ee: Estonian Quarterly of Art and Visual Culture, Special section on Sound Art, Jun 2006. Organised Sound: An International Journal of Music and Technology, 14(1): Sound Art, ed. Jøran Rudi, Cambridge University Press, 2009, 115 pp. Continent. 5(3): "Acoustic Infrastructures", eds. Jamie Allen, Lital Khaikin, and Isaac Linder, Aug 2016. Evental Aesthetics 6(1): "Sound Art and Environment", ed. Gascia Ouzounian, 2017. Seismograf: "Sound Art Matters", eds. Sanne Krogh Groth, Anette Vandsø, Ulrik Schmidt, and Morten Søndergaard, 2017. Based on the conference held in Aarhus in June 2016. David Toop, "Sonic Boom", in Sonic Boom: The Art of Sound, London: Hayward Gallery, 2000, pp 107-131. "[Sound art is] sound combined with visual art practices" (107). Max Neuhaus, "Sound Art? ", in Volume: Bed of Sound, New York: P.S. 1 Contemporary Art Center, 2000. Keith Townsend Obadike, "What's in a Name? Seeing Sound Art in Black Visual Traditions", Art Journal 60:4, Winter 2001, pp 4-5. Julian Cowley, Annotations for Sound Art, 2003, 11 pp. Cat Hope, "Sound Art / Mobile Art", in Sound Scripts: Proceedings of the Inaugural Totally Huge New Music Festival Conference 2005, eds. Cat Hope and Jonathan Marshall, Edith Cowan University, 2006, pp 42-38. Douglas Kahn, "The Arts of Sound Art and Music", The Iowa Review Web 8(1): Special issue on Sound Art, ed. Ben Basan, February/March 2006. 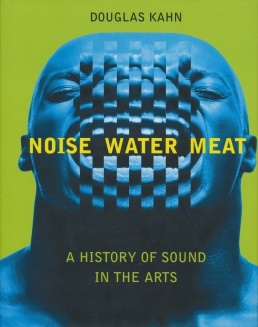 "I took [Dan] Lander's idea [of "musicalization of sound"] and began to historically research and substantiate it, first in the late-1980s and later in my book Noise, Water, Meat [(1999)]" (7). "From Music to Sound: Being as Time in the Sonic Arts". Anne Thurmann-Jajes, "Sound Art", trans. Judith Rosenthal, in Sound Art: Between Avant-Garde and Pop Culture, eds. Anne Thurmann-Jajes, Sabine Breitsameter and Winfried Pauleit, Cologne: Salon, 2006, pp 29-35. Miguel Molina Alarcón, "Echoes of Sound Art in Spanish Historical Avant-Garde", in MASE, 2006. Christoph Metzger, "Sounds Typically German - 'Klangkunst'", World New Music Magazine 16 (Jul 2006), ed. Stefan Fricke, Saarbrücken: PFAU, pp 53-57. Andy Hamilton, "Music and the Aural Arts", British Journal of Aesthetics 47:1 (January 2007), pp 46-63. Paul Hegarty, "Sound Art", Chapter 11 of Noise/Music: A History, Continuum, 2007, pp 169-178. Alan Licht, "Sound Art: Origins, development and ambiguities", Organised Sound 14:1 (April 2009), pp 3-10. "The roots of sound art lie in the disjunction of soundand image afforded by the inventions of the telephone and audio recording as well as the ages-old notion of acoustic space" (4). Robert Michael Brain, "Genealogy of 'Zang Tumb Tumb': Experimental Phonetics, Vers Libre, and Modernist Sound Art", Grey Room 43 (Spring 2011), pp 88-117. Gascia Ouzounian, "Sound Art", in Oxford Encyclopedia of Aesthetics, 2nd ed., Oxford University Press, 2014, pp 27-31. Katsushi Nakagawa, Tomotaro Kaneko, "A Documentation of Sound Art in Japan: Sound Garden (1987–1994) and the Sound Art Exhibitions of 1980s Japan", Leonardo Music Journal 27, Dec 2017, pp 82-86. Edward Sanderson, "Is Sound Critical?—”Grounds for Sound” Research and Practice", Ran Dian, 29 Jun 2018. On critical sound art in China. Gascia Ouzounian, Sound Art and Spatial Practices: Situating Sound Installation Art Since 1958, San Diego: University of California, 2008, 373 pp. PhD dissertation. Tristan Louth-Robins, Still and Moving Lines. Listening and Signification in Sound Art, University of Adelaide, 2010, 65 pp. Master's thesis. Yolande Harris, Scorescapes: On Sound, Environment and Sonic Consciousness, Leiden University, 2011, 146 pp. PhD dissertation. Laura Maes, Sounding Sound Art: A Study of the Definition, Origin, Context, and Techniques of Sound Art, Ghent: Universiteit Gent, 2013, xxiv+571 pp. PhD dissertation. Lucie Vágnerová, Sirens/Cyborgs: Sound Technologies and the Musical Body, New York: Columbia University, 2016, 242 pp. PhD dissertation. "New Sonic Paths: Sound Studies Expanded", -empyre, July 2014. Moderated by Renate Ferro, Timothy Murray, et al. Intro. 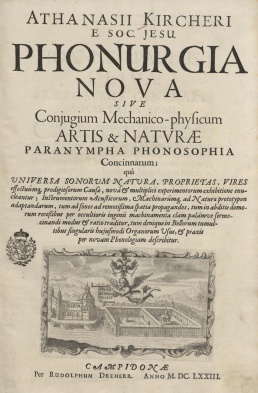 Athanasius Kircher, Phonurgia nova, 1673. View online. John Cage, Silence, 1961. Download. 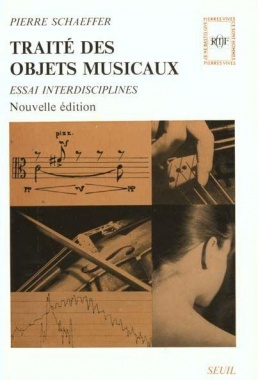 Pierre Schaeffer, Traité des objets musicaux, 1966. Contains "Acousmatics" (EN). Athanasius Kircher, Phonurgia nova, sive conjugium mechanico-physicum artis & natvrae paranympha phonosophia concinnatum, Kempten: Rudolph Dreherr, 1673. (Latin). 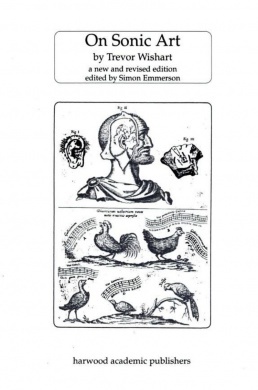 Early book on sound, acoustics and music; describes acoustic apparatuses and phenomena such as the tuba stentorophonica [the loud trumpet], the statua citofonica [the talking statue], or the Aeolian harp. Scans online: , . Commentaries: , . Luigi Russolo, L’Arte dei rumori, Milan: Edizione Futuriste di Poesia, 1916, 92 pp. (Italian). The manifesto was first published on 11 March 1913. The Art of Noises, trans. 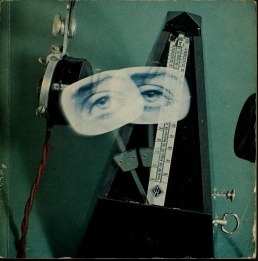 Robert Filliou, Something Else Press, 1967. Manifesto only. The Art of Noises, trans. Barclay Brown, New York: Pendragon, 1987, 87 pp. "El arte de los ruidos. Manifiesto Futurista", Sin Titulo 3 (1996), UCLM, pp 8-15. (Spanish). Manifesto only. L’Art des bruits. Manifeste futuriste, 2003; 4th ed., 2013. (French). Manifesto only. Iskusstvo shumov [Искусство шумов]. (Russian). The manifesto only. In Search of a Concrete Music, trans. John Dack and Christine North, University of California Press, 2012, 244 pp. 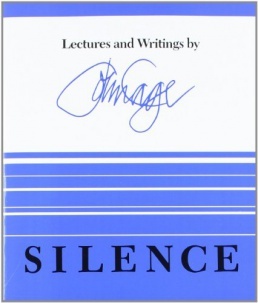 John Cage, Silence: Lectures and Writings, Wesleyan University Press, 1961, 276 pp. Includes the essay "Acousmatics"; trans. in Audio Culture: Readings in Modern Music, eds. Christoph Cox and Daniel Warner, Bloomsbury, 2004, pp 76-81. Trained as a radio engineer and announcer, Schaeffer was fascinated by the fact that radio and recording made possible a new experience of sound--what he called "reduced listening" or "acousmatic listening"--that disclosed a new domain of sounds--objets sonores or sonorous objects, the objects of "acousmatic listening". Bernhard Leitner, "Sound Architecture - Space created through traveling sound", Artforum 9:7 (March 1971), New York. Bernhard Leitner, "Sound Space Manifesto", New York, 1977. R. Murray Schafer, The Tuning of the World: Toward a Theory of Soundscape Design, New York: Knopf, 1977; repr. as The Soundscape: Our Sonic Environment and the Tuning of the World, Rochester, VT: Destiny Books, 1993, 320 pp. Brian Eno, "Ambient Music", Ambient 1: Music for Airports, EG Records, 1978. 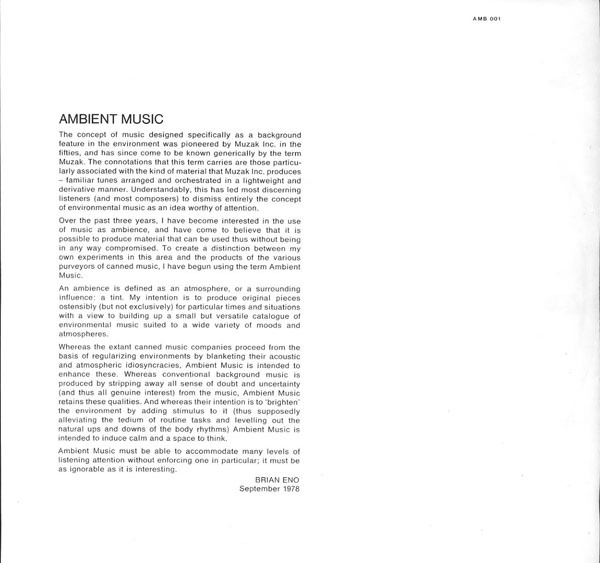 Liner notes to LP/cassette.  . See also "Ambient Music", in Audio Culture: Readings in Modern Music, eds. Christoph Cox and Daniel Warner, Bloomsbury, 2004, pp 94-97, written in 1996; and discussion of his self-published Music for Non-Musicians, c1970, in Eno and Mills, More Dark than Shark, 1986. David Toop, Ocean of Sound: Aether Talk, Ambient Sound and Imaginary Worlds, Serpent’s Tail, 1995, 306 pp; 2001. Articles and papers on sound art, compiled by Jérôme Joy and Thom Holmes. Her Noise Archive, a resource of collected materials investigating music and sound histories in relation to gender, by Anne Hilde Neset and Lina Džuverović. Ear Room, an online interview publication focusing on the complex use of sound in artistic practice, by Mark Peter Wright. The African and Asian alternative database, "experimental, sound art, noise and alternative electronic music from underrated continents"; maintained by Syrphe. SONM Archive, Sound Archive of Experimental Music and Sound Art, established in in 2010 by Francisco López. ICA SoundWorks, a collection of over one hundred commissioned sound works. Soundbag, an internet project by Rolf Langebartel. Sound Art Text, a blog by Hannah Kemp-Welch. The EAM librarian, a blog about literature and web resources on electroacoustic music and sound art, edited by Pär Johansson. foundsoundscape, online radio collage of found-sound places, curated by Janek Schaefer, with contributions from 100+ artists. Outside Sounds: Extrapool Sound Archive, eds. Wesley Goatley and Extrapool. Field recording, Radio art, Streaming media, Sound studies, Noise, Circuit bending, SuperCollider. This page has been accessed 186,331 times.